After logging into Doxpop and logging into e-filing with your credentials; find and click the "File New Case" link. 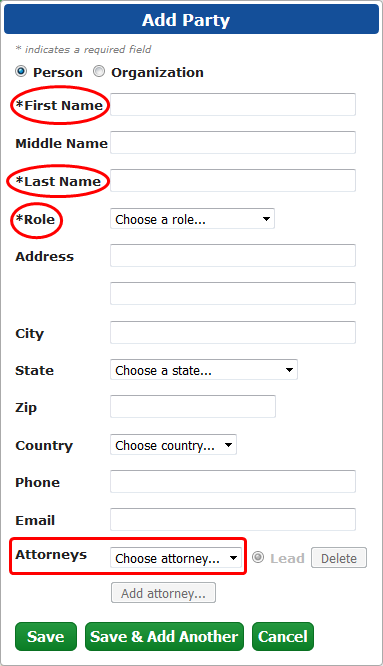 Beginning with the "Case Information" section, you will select the Attorney from the top drop down list. Optionally, click the check box to attach a service contact from your firm's account. * Your service contact information will be added to your new case once the Clerk has accepted your filing(s). Once that section is completed, the Case Parties, Documents, and Fees sections will be presented. Notice the green button will first show and a list of all the required party types. In this example, there are 3 required party types. 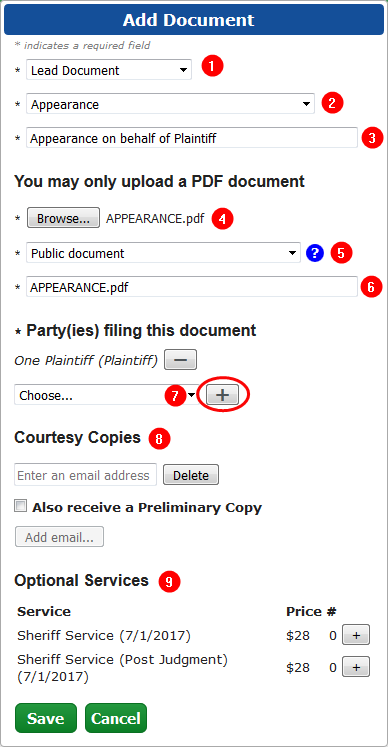 You will not be able to submit a filing until all party types have been identified in the "Case Parties" section. You will not be able to enter other party types until all of the required parties have been identified. * For the party that the attorney is representing; select the attorney's name from the drop down menu at the bottom of the form before saving. Once the requirements have been met, you can then begin to enter other parties. Notice the green button now reads . For this example we entered an Interested Person as a Third Party. Please Note: The Petitioner and Personal Representative may be the same person. Since those party types are required their name will appear twice in the party section. To begin adding your documents to be submitted, find and click the button. After you have addressed all of the subjects above, the fees section is the last area to complete.